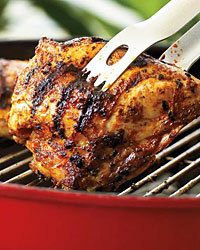 F&W’s latest grilling articles, recipes, expert tips and more. Click through the “Recipes in this Article” box (at right) for twelve cookout favorites (like fragrant, fiery hot and smoky Jamaican Jerk Chicken) from F&W staff. Steven Raichlen, host of TVs Barbecue University, distills a library of advice into 10 simple tips—with fabulous recipes to illustrate each lesson. Four foolproof burgers from the F&W test kitchen.